Living room ideas: Top20 – Zylinder V2A stainless steel single drapery rod. Drape rod Top20 - Zylinder, single-rail. 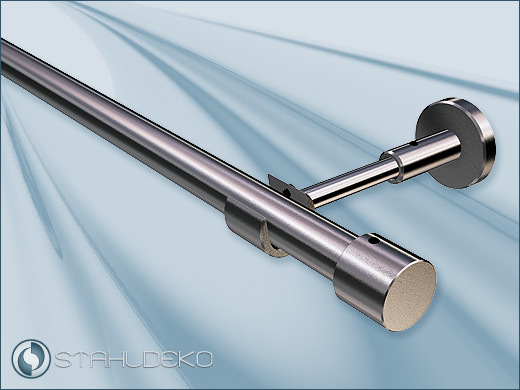 1-rail drape rod made of stainless steel V2A, with stainless steel tube Ø 20 mm, bracket system Top20, end knob Zylinder. Decoration with looped drapes. Mounting system Top 20, 1-rail. Stahldeko - Living ideas: deco-rod Ø 20mm made of stainless steel V2A, with open bracket system Top20 and finials Zylinder20 as 1-rail drape rod. With this drape rod you can easily make drapery decoration on the floor and then mount the completely decorated rod with curtain or drape on the brackets. Looped curtains decorate directly on the rod, without rings. End knob Welle 20, stainless steel V2A. Drape rod Top20 - Zylinder, double-rail. Stylish set Top20 - Welle, single-rail, with V2A rings.